Hi everyone! My name is Tara and I write over at A Spectacled Owl, where I write about products I enjoy, post giveaways for really cool products and attempt to try my hand at some crafts and DIY projects. 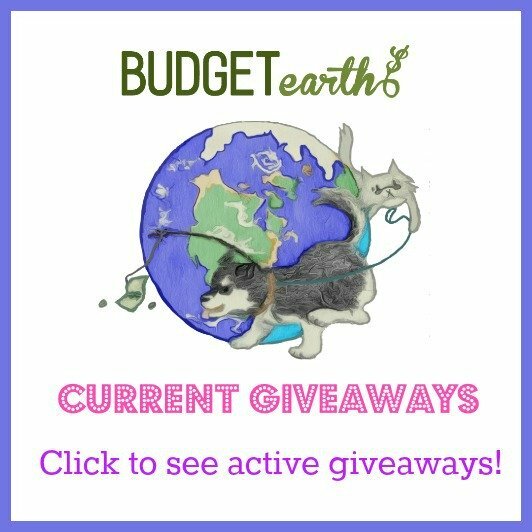 I’m really excited that Susan has asked me to guest post here today because not only do I enjoy Budget Earth, I also consider her a good friend! I love reading blogs that have all sorts of fun crafts & DIY projects, plus I am a Pinterest addict. I also love taking things that are ugly and boring and giving them a new life! 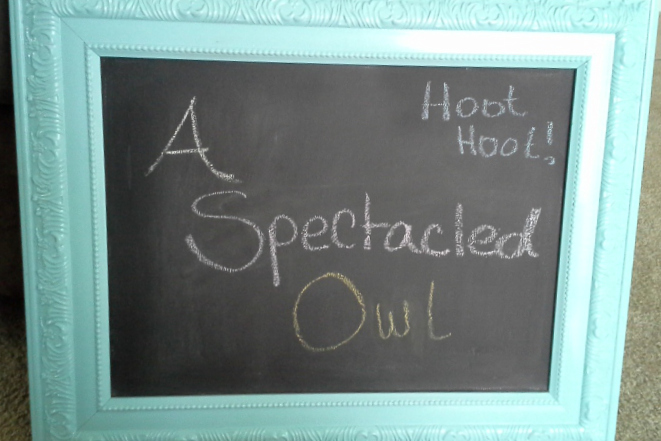 I’ve been wanting to make my kids a chalkboard for awhile and now that I have, I can’t wait to share it with you all! The first thing I did was take out all the old staples that were securing the painting to the frame, plus unscrewed the wire hanger from the back. A lot of the staples were pretty brittle so they kept breaking but using needle nosed pliers really helped (and a whole lotta muscle!). Once I got the painting loose, I placed it on my painting tarp and covered it with 3 layers of primer spray paint (waiting about 10 minutes in between coats.) While waiting in between coats for the chalkboard paint to dry, I started spray painting the frame. I knew it would need a few coats and I was very careful to cover all of the details but also to not go heavy on spraying the paint. I’ve been known to be heavy handed with spray paint in the past & the drips that occur from that aren’t fun! After 3 coats of Krylon’s Blue Ocean Breeze, I got the look I was going for. I let it dry overnight, then called out my husband to help me. I have a “thing” with staple guns (OK, yes! I’m afraid of them!) and knew I would have to use one so I had him load it and attach the chalkboard painting back to the frame. 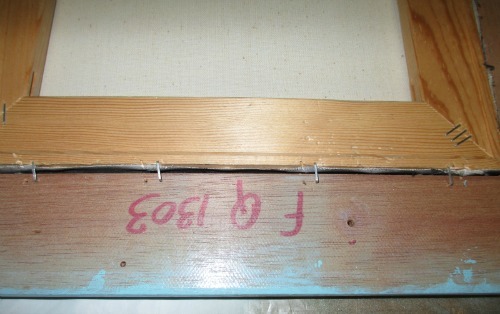 Then, I attached the wire hanger that came with the frame. On the chalkboard paint spray can, it said I needed to rub chalk all over the surface of the now dry paint, wipe it off with a cloth or chalk eraser and then we were ready to use it! I am super happy with how this project turned out & it really was easy. I bought the painting at a thrift store but you could do this with a painting and frame that you have in your home that maybe you don’t like anymore or doesn’t fit your decor. 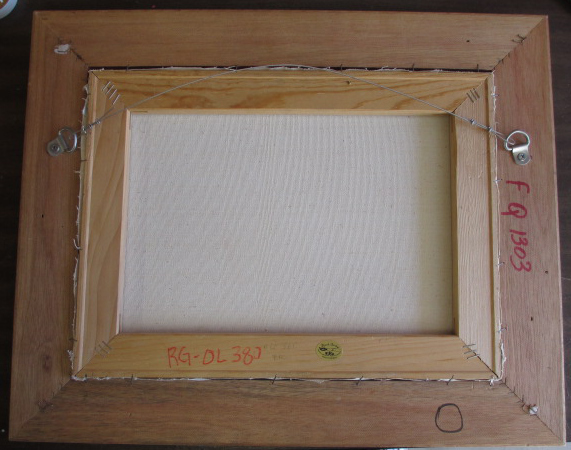 Or, if you have just the frame, you could head to your nearest home improvement store, have them cut a piece of plywood to fit inside your frame, prime it and then use chalkboard paint on there. I plan on making another one once I find another really neat frame. If you make your own chalkboard, I’d love to see it! Even if you don’t make one, I’d love for you to drop by my site! You can find me over at A Spectacled Owl, plus you can find me on Facebook, Twitter, Pinterest and Google+. Special thanks to Susan for letting me share my new chalkboard with you all! That looks so simple and would make a very nice gift. I agree Jayne. This is a great idea. I will be making one to give to my friend. Maybe I don't get out enough but I didn't even know you could buy chalkboard paint.LOLNow that I know about this product I am enthusiastic about your idea and actually want to try this so cute and rewarding project too.Thanks. I love this idea! I need to try this it. Love this tutorial. This is adorable – I have some old frames that would be perfect. I can make one for each kid's room for reminders/play and make one for myself! Thanks for the brilliant idea. Very cute project to do with the kids! I love it! Chalkboard paint is my new faveriot. I'm using it on everything. Makes for a great changable lable for jars. This is an awesome project, I love this post, thanks for sharing! I love this project! I need to do this very soon. I'm not very creative but I think I can do this. I have been wanting to start up "Project Saturdays," but I haven't known what I've wanted to make! This looks like something fun I can experiment with! Love it! I have to try this! I would love to create one with the kids. Gonna bookmark this page and try this. Thanks! This is cool! And you can choose your own pretty frame too! Great for children's rooms too. Thanks for sharing! Oh wow, I love this! Looks easy enough for even someone like me to do! The Blue Ocean Breeze is a wonderful color too. I love it! I'm definitely making one for my son in a plastic type frame for him to take to doctors appt, etc. This project looks really fun. Thanks for sharing! I love, love, love the idea – so pretty yet functional. And that was a terrific tutorial too! Neat idea! My mom had this picture that she was getting rid of that I thought was hideous… sorry mom… but I loved the frame so I took it home. It's been sitting there waiting for a new purpose for three years. I think it found one! Thanks so much for the great post! I am looking foward to making a chalkboard for my kitchen! i love this, kids would love it! thanks so much for the idea! My kids love their own chalkboards. Making them was the best part. Wow! What a neat, fun, activity! This also seems pretty easy. Now I want one for my kitchen. Good tutorial with clear steps. Thanks. This is too cool, would love to do this for our kitchen! Yours came out so very cute. I've been wanting to experiment with chalkboard paint for a while, but just haven't done it. This would be the perfect beginners craft with it!!!! Good idea for a gift! Love that. It would be a great project for my grandkids. this is a def project i will be doing soon! I wanted to buy the chalkboard paint to put on on cups. We're going to make planters out of them. I have been looking every where for a chalk board to use as a prop and to see this, I am excited because this seemed really easy to make and I am gonna make me a few. I am so glad I ran across your blog. I can't wait to make this for the little girls I watch they would love this. Awesome idea and so easy to do!! My 2 year old granddaughter would LOVE this for her play room. I would also like to put this in my kitchen for my Things To Do List!! Thanks alot!! This is a great project, I am going to try it out next weekend. this looks so easy! something to do for the kids! Thanks for sharing this with us. It looks so easy and I need one for my kitchen and my office. I hope mine will look as good as yours. I really need to make one of these for the kitchen and this tutorial makes it look so easy 🙂 Thank you. This si such a good idea!!! well isnt that just the niftiest thing EVER so doing thanks thanks thanks! This is definitely something I can do myself. I often wondered about how well those cans of chalkboard stuff worked but it seems to have done just fine for you. 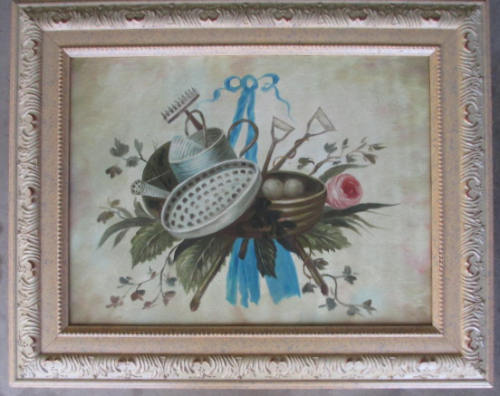 I know what I will be hunting for on my next garage sale outing…an ugly old picture with a good frame. It would be really cool to use this paint on one whole wall of a kid's room – what a blast! I absolutely LOVE this DIY! You can do so many things with it and be so uniquely creative! 🙂 Thanks for sharing! I like using chalkboard paint. I spray jar lids and can lavel them. This is for those that the item changes inside quite regularly. This actually looks really simple and I need one for my kitchen. Thanks for sharing. Looks great! I'm putting this on my "to-do" list for new house! Not only is this a great idea, it looks like it's a lot of fun to make. You can always go to the local Thrift Store or Salvation Army Store to find a picture or just a frame. Thanks for sharing. I can't wait to have a spot to put one for my kids. The little ones love drawing on my walls…..I really need a spot that it would be ok for them to draw. I have considered making one of these, so thanks for the tutorial. Maybe a summer project for my daughter. Nicely made, your finished product is really cute. I'm always concerned about all the chalk dust in the bedroom though. It really works it way down carpet. This would be cute made from a window frame and plywood. Then you would be able to add a shelf to catch all the chalk dust. I'm surprised the paint only needed ten minutes between coates..
Great idea for a homeschool project! I love this idea for helping teach kids to be responsible, starting with teaching them to jot down when they need new school supplies. How many times have we run out that night to get something they forgot to tell us they needed! This is really cute! 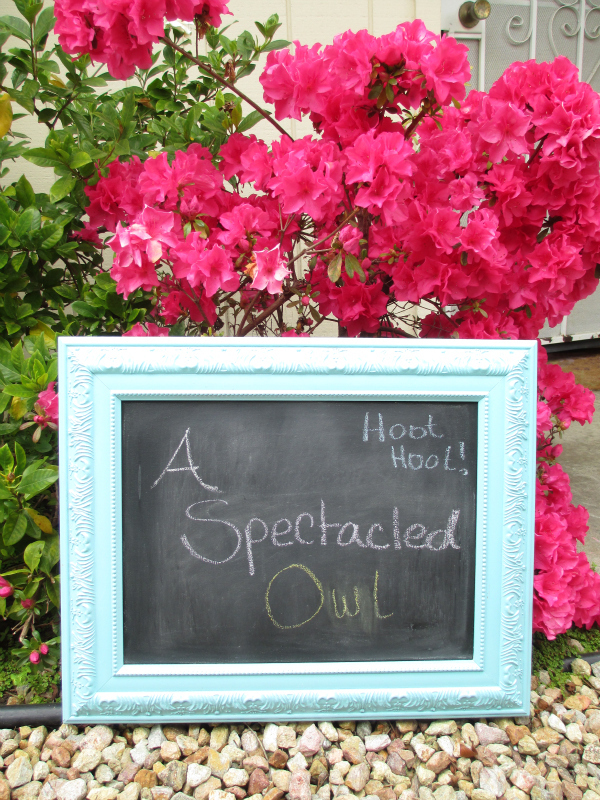 I love spray-on chalkboard material – so many creative potential uses for it! absolutely awesome, thanks for this, i will be making one of these soon for my daughter's first birthday photo shoot! You are great, thanks for the tutorial! Nice upcycling idea. Especially with the upcoming garage sale season! Awesome tutorial! I'll be sure to try it on some of the unwanted frames I have lying around. This would suit them much better than their current forms. I am going to make a few of these to stick in gift baskets and use as the tag at the same time thank you! This is so cool and so cute too!! Well, some of the things that are sold at thrift stores aren’t really antiques – more just trash or things that looks like antiques. There are a lot of fakes out there. Thanks for the tips. I tried to paint the chalkboards at church and they came out horribly. I will try some of your ideas to repaint the boards. I am already on the hunt for pics to do this with! I see gifts galore in the near future. I love to do crafts in the summer while I can be outside w/out freezing my buns off! I just love this idea. I am thinking to do it for kids too! Thanks so much! I seriously need to try this out. We have around 3 outdated paintings here that I can't get rid of. Now, I know what to do with them. Luv'in this!! I'm always looking for DIY project to do with my 5 yr old G'son. We could really have a lot of fun with this. He has a space in his room that would surly welcome this awesome chalkboard. Thanks guys!! My grandsons would love to have one of these at daddy's house! Going to have to make them one. I think I can handle this with my one good hand! LOL TFS! I have seen this done and would love to try it. I have seen childrens tabletops too and I am debating this right now with a new table I bought for the children! I was wondering since you have finished would you have used more coats of chalkboard paint and how many cans? One? This is a great project to work on with my daughter over the weekend. Cute! 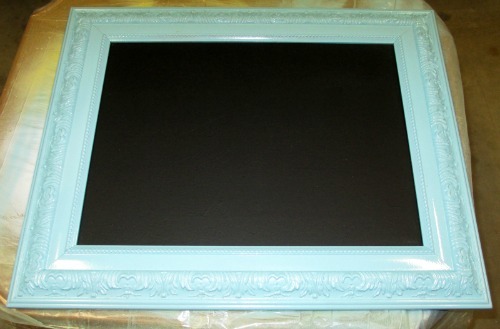 I would love to try this with colored chalkboard paint, I have seen that you can get that too. What a great project! I'm making 2, one for my kitchen and one for my office. Wow I have a ton of old ugly painting that I was wanting to do something with this is such a great idea and I could use them for all the kids rooms and my office thank you so much fir the idea and the instructions on how to do it ! Such an awesome idea, especially to use as a memo board or as a small spot for your kids to get creative. Make your own chalkboard?! I didn't even know that was possible! As an environmentalist, I like the thought of conserving paper for notes, to do lists, etc. I also like the thought of reusing an old item, too. my daughter would love this! Can't wait to show this to my husband and try it out! This looks so easy. I will have to do this for my kids. I bought an old plexi glass door at a garage sale for $2, my plan is to turn it into a chalkboard for the kids! Great tutorial! I tried chalkboard paint once but it didn't turn out so well. This is an inexpensive yet practical idea! Really simple, useful, and cute. This is a great way to make chalkboards for your home and kids. You can easily customize the frames to each taste. 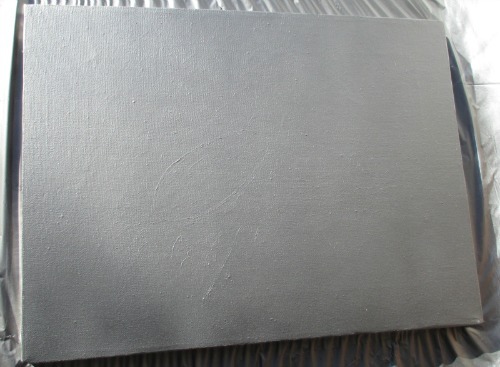 Chalkboard paint is really wonderful. It sure beats post it notes all over. And, it's better than nagging. I have heard of using chalkboard paint but hadn't thought about a project like this. This would be an awesome addition to my kitchen. That's a good way for busy families to communicate whith chores, phone mess. etc. This would be a cool project and seems simple!! This is super fun, thank you for sharing. The end result looks so great! I think I might need to try this.